Free shipping. Buy direct from HP. 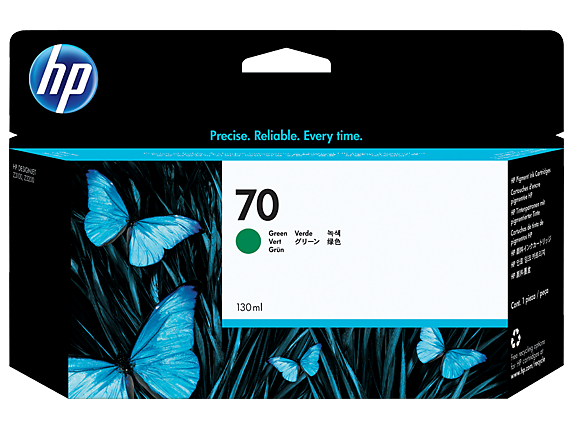 See customer reviews and comparisons for the HP 70 130-ml Green DesignJet Ink Cartridge. Upgrades and savings on select products. Original HP Photo Inks are designed for problem-free printing with exclusive dispersion technology.HP 2-packs and individually replaceable ink cartridges make printing easy and cost-effective.Avoid waste and rework—HP media and Original HP Photo Inks are designed together to work together.To ensure problem-free printing, Original HP Photo Inks are rigorously tested.Avoid downtime with the legendary quality and reliability of HP. Quality that lasts—Original HP Photo Inks. Prints achieve over 200 years print permanence on a range of HP creative and specialty media. The wide color gamut of Original HP Photo Ink gives you millions of color combinations to work with.Original HP Photo Inks produce true gray neutrality and rich black density.Skip the trial and error—our broad range of media is designed and tested with Original HP Photo Ink. Prints achieve over 200 years print permanence on a range of HP creative and specialty media.The wide color gamut of Original HP Photo Ink gives you millions of color combinations to work with.Original HP Photo Inks produce true gray neutrality and rich black density.Skip the trial and error—our broad range of media is designed and tested with Original HP Photo Ink.